Based on the book by Robert Ludlum, the Bourne Ultimatum is the final installment in the critically acclaimed Bourne Trilogy. The Bourne Ultimatum stars Matt Damon as Jason Bourne, the most highly trained CIA spy on the run from those who created him. Bourne is suffering from amnesia and is trying to piece together what happened to him while he was under the CIA’s control. This film follows a different formula than the other Bourne movies by focusing on the agents that are attempting to find him. Because of the death of his girlfriend, Bourne doesn’t have a lot of dialogue, as he is usually alone. Most of the conversations happen between the CIA agents in their headquarters. This sets the film apart from most action movies. Instead of the primary focus on the main character and his beliefs, we are watching the antagonists trying to thwart the hero at every turn. This adds to the tension of the film when the CIA is about to capture him yet fail miserably. We are always unsure on what Bourne’s motives are and what he plans to do. This makes the film have the element of surprise throughout. As is tradition with the Borne films there are plenty of European set pieces that show off the culture of their respective cities. The movie begins in Paris and goes through Madrid, Morocco, and eventually crosses the ocean to New York City. The fight scenes are unique from the average American action film, because we get to see new environments that include possible ways to escape capture. As is tradition in the Bourne films there is a high-octane car chase scene that obviously ends in a climactic crash. Overall, The Bourne Ultimatum is a great thriller action movie. Jason Bourne continues to deliver as a top tier American spy. With the reversed perspectives on the dialogue, we get a different look on how the agency works, and how it tries to take Bourne down. 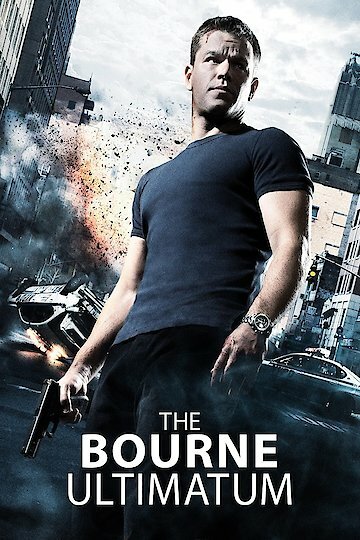 Not just a simple action hero, Bourne struggles with his amnesia and tries to remember his past. Bourne looks for forgiveness from the people he has killed, and tries to figure out the truth behind Operation Treadstone. The Bourne Ultimatum is currently available to watch and stream, buy on demand at Amazon, Vudu, Google Play, FandangoNow, iTunes, YouTube VOD online.